Any book which starts with the characters discussing James Stewart films is fine by me. I knew within a few pages I was going to love this book and I did! Dodie is the owner of Forget-Me-Not Vintage, a shop selling vintage clothes and accessories and I have to say, her passion for her business make it sound like a wonderful shop to visit. When she finds an old love letter from World War Two in the pocket of one of the coats in her shop, she embarks on a quest to find out what happened to the writer and recipient and return it to the rightful owner. With not much to go on, she decides first of all to visit the address on the envelope. The problem is the full name and address has been worn off so she has to try random houses on the street. And at one of these houses, she meets Ed Willoughby who also, initially reluctantly, becomes involved in the search. Finding that letter in the old jacket was a terrific hook to keep me absorbed in this story. I would love to find something like that tucked away in an attic, an old book or, as in the story, in old clothes. Like Dodie, I would be desperate to know about the people too and would probably become obsessed with finding out about them. Alongside the mystery aspect of this story, Tilly Tennant really brought to life the Christmas atmosphere in the town making wish that our own Christmas Markets were already open for me to wander around. The author described the delicious smells from the stalls along with all the twinkling lights and the Christmas music in the air so well, that I could picture the scene easily. There was of course a romantic element to the story too with Dodie becoming attracted to Ed which was making her question her relationship with Ryan. Or Brian as her slightly dotty Gran insisted on calling him. I had a real soft spot for Dodie’s Gran – she provided a lot of funny moments throughout the book and the close relationship between them was touchingly portrayed. Ed was a really interesting character as his moods seemed to swing from one extreme to another which was confusing for Dodie. As we learned more about his background, he became easier to understand. But could he be ‘her very own James Stewart’? When she is already thinking of him as “so gorgeous…lovely and kind, chivalrous and considerate, deep and interesting” I think us readers already know what we want the answer to be! 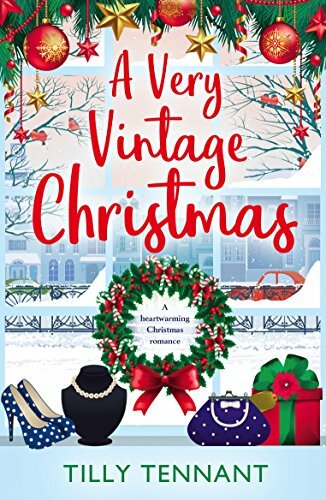 A Very Vintage Christmas is a heartwarming Christmas read which I loved. It’ll definitely put you in the mood for Christmas, it’s very romantic and the mystery of the letter is such a lovely part of the story. I’d say this is a must-read for the festive season, a story to leave you feeling all warm inside whatever the weather outside. Thanks to publishers Bookouture for my review copy of this book. A Very Vintage Christmas is available now in both paperback and ebook format. You can order a copy online here. Tilly Tennant has another Christmas book out this year too called A Cosy Candlelit Christmas which follows Dodie’s friend Isla, who we meet in this book, as she travels to France. You can order that here. Oh this sounds absolutely lovely. That letter would hook me in straightaway too. The Gran was a complete hoot!